Nearly all the 54 Republican U.S. senators will vote in favor of the Kirk-Menendez bill requiring sanctions on Iran if the P5+1 negotiations fail. President Obama has promised to veto it. Now, the senate is gearing up for a high-drama vote; will Democrats provide the 13 to 15 votes needed for a veto-proof majority? (2) submits to the appropriate congressional committees a comprehensive report on the status of the negotiations toward a long-term comprehensive solution that includes an assessment of the likelihood of reaching that solution and the time frame anticipated for achieving that solution. What's the point, one might ask, of the pro-sanctions side struggling so hard to attain a veto-proof majority when Obama can negate its provisions at will? Why does the White House expend so much political capital stopping this bill when it could let it pass and then kill it by invoking the waiver? 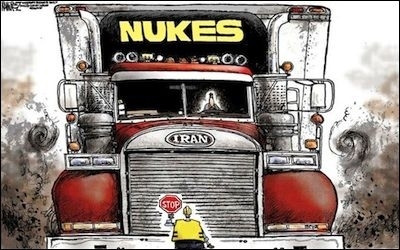 Indeed, Obama has already made statements along the very lines the bill requires, notably in his State of the Union (SOTU) address in January, when he (falsely) claimed that "for the first time in a decade, we've halted the progress of its nuclear program and reduced its stockpile of nuclear material." On the other side, why does the White House expend so much political capital stopping this bill when it could let it pass and then kill it by invoking the waiver? Why the major combat over what amounts to a symbolic resolution? In part, it increasingly embarrasses Obama by making him unceasingly justify the waver every 30 days. But also, as he glancingly explained in the SOTU, he passionately wants Kirk-Menendez defeated because "new sanctions passed by this Congress, at this moment in time, will all but guarantee that diplomacy fails … [by] ensuring that Iran starts up its nuclear program again." The Iranian Majlis sure looks like a real parliament. 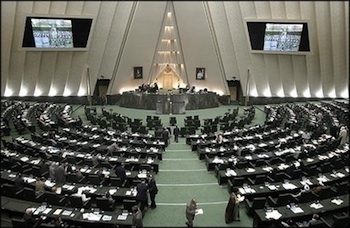 In other words, the Iranian pseudo-parliament (the Majlis) is warning that the bill's passage – even if its sanctions are subsequently waived – in itself cancels the existing interim accord and ends the negotiating process. Iran's foreign minister also declared that the Majlis would retaliate against any new U.S. sanctions legislation by ramping up the nuclear program; and that new sanctions would damage the West's favorite Iranian politician, President Hassan Rouhani. With this clever tactic, the Iranians have provoked a grand test of wills in Washington, turning Obama into their enforcer obliged to tame Congress; Majlis speaker Ali Larijani has warned that "If Obama can't solve his problems [with Congress], he himself will be responsible for the disruption of the negotiations." Rather than tell Tehran to take a hike, the administration (in keeping with its larger strategy) fell for this ruse, resulting in a forthcoming Senate battle royal. Of course, cajoling Tehran to the negotiating table ignores how the much Iranians benefited from the last accord, signed in November 2013, and how they expect to do as well in the next one. It also ignores that, to provide diplomatic cover as their approximately 10,000 centrifuges busily whirl away, they seek ad nauseam negotiations. Is this not reminiscent of the bazaar, where the wily merchant charmingly cheats the naïve tourist? The stake, however, is not the price of a Persian carpet but an apocalyptic rogue regime acquiring and perhaps deploying nuclear weapons. And so, the toothless Kirk-Menendez bill actually does have real importance. It needs those 67 votes.